Please ensure to bring your bus ticket. Either print it out or show it on your smart phone. Dress for the weather. This is Ireland, in May so please be prepared. No alcohol will be permitted on board under any circumstance. See below, warning issued by MCD & An Garda Siochana. Arrive in plenty of time to get the bus. Preserve your phone battery – Slane is a very long day so minimise phone usage. It is important that we are able to contact after the gig, if you get lost. Please forward by email to sales@kellytravel.ie as many extra names and phone numbers for your group as possible. If you have friends booked in separately with Kelly Travel and you want to be on the same bus, you need to notify us TODAY by emailing sales@kellytravel.ie with the names and phone numbers of those you wish to travel with. We will do everything in our power to assist but cannot guarantee we will be able to comply with every request. All Kelly Travel Buses will all be parked at the RED COACH PARK. You will be dropped off at the RED COACH PARK. You must make your way back to the RED COACH PARK. You will enter Slane through the RED GATE. You MUST exit through the same RED GATE. DO NOT walk up the N51 towards Navan. DO NOT walk up the N51 towards Slane Village. Please study the map attached carefully. We will not leave without you as long as we can contact you. If you get lost, keep calm and call 061 384422. Kelly Travel will be providing return bus services to Slane in 2015. We NEVER leave anyone unaccounted for! Say hi on Facebook or send us a tweet if you have any questions. It is the policy of An Garda Síochána and MCD Productions that no coach or bus companies permit patrons bearing alcohol or those who are intoxicated to board coaches to this event. Alcohol consumption on buses is illegal and a fine system to the driver and coach operator will be in place. No intoxicated patrons or those bearing alcohol will be permitted to disembark from coaches to the event area. To this end we would appreciate if this message could be communicated to all customers travelling via your concert bus or coach service. Alcohol is not permitted on board. You may store any alcohol you wish to bring in the underside luggage compartments. Once paid for, tickets will be sent to you by email. These can be printed off, or shown to the driver on your phone. All Kelly Travel buses will be parked at the RED COACH PARK. Unruly behaviour, violence or intimidation towards staff or other passengers will not be tolerated. Please ensure your phone has battery and is switched on after the concert. All reasonable efforts will be made to ensure all passengers get back to the buses after the event. To this end, please ensure we have a correct mobile contact number for you and at least one other member of your group. Please provide us with as many phone numbers as possible for you and your group, encase we cannot contact you. Onboard WC cannot be guaranteed. Rest breaks will be taken en route. Onboard WiFi cannot be guaranteed. You may leave items on the bus – as long as you get back to the bus on time, you will travel home on the same bus you came up on. Kelly Travel cannot assume responsibility for items left on the bus – we recommend you not leave anything of value behind. Buses will be parked in the official coach parking area at Slane Castle. It is the closest possible location to the site but some walking is inevitable. Please wear suitable clothing – Slane is an outdoor event and this is Ireland in May, be prepared. Tickets must be booked in advance, either online at www.concert-travel.com or by calling 061 384422. Seats cannot be reserved until fully paid for. No refunds can be issued within 72 hours of the departure time, for any reason other than cancellation of the bus service. Passengers will be issued with handy wristbands which are much easier to look after and contain our contact info, just encase you get lost or need assistance. Kelly Travel’s number one priority is to get all passengers to and from the event safely. With this in mind, please follow the instructions of Kelly Travel staff, drivers and management. We will ensure you are in the best position possible to enjoy the Slane concert by getting you there in plenty of time, in comfort and style plus get you home quickly and safely after the event. Munster’s only dedicated professional concert bus service, we have over 20 years experience servicing Ireland’s greatest events! 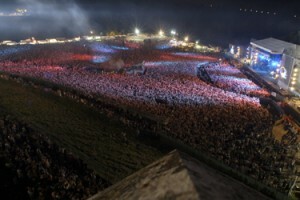 Since 1981, Slane castle has hosted the largest outdoor concerts in Ireland. Rolling Stones, Madonna, Queen, Bob Dylan, Robbie Williams, David Bowie, U2, Bruce Springsteen, Red Hot Chilli Peppers, Oasis, REM and Kings of Leon are just some of the world renowned acts that have played at the historic Slane castle venue.